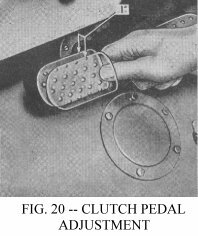 The clutch is of the single, dry plate type consisting of a pressure plate assembly, having three pressure springs, three release levers; and a spring cushioned, faced driving plate mounted on a hardened steel, splined hub. Clutch release is accomplished by moving the release bearing toward the flywheel. The three springs located in the clutch bracket provide the driving pressure, thus, when the foot pressure is removed from the pedal, the springs force the pressure plate forward against the driven plate, gradually and smoothly applying power to the wheels. As the clutch facings wear, the clearance between the release levers and the release bearing is decreased. The effect on the clutch pedal is to decrease the free travel, which is the distance the pedal moves away from the toe board before the release bearing comes into contact with the release levers. Adjusting the length of the clutch control cable to increase the free travel of the clutch pedal, restores the proper clearance between the release levers and the release bearing. See Fig. 20. The release bearing and clutch pedal must be in their proper positions. No adjustment of the clutch proper is required to compensate for wear of the facings, but a clearance of approximately 1/8” (3.12 mm.) should be maintained between the release levers Fig. 21, No. 14 and the release bearing No. 7. To obtain this clearance, adjust the length of the clutch control cable No. 18, so that the pedal has 1” (25.40 mm.) free movement from the fully engaged position before any resistance can be felt. CAUTION: Avoid the practice of resting the foot continuously on the clutch pedal while driving and do not slip the clutch excessively instead of shifting gears. Slipping the clutch causes excessive heat, with the result that the clutch is finally made inoperative. The transmission is a heavy duty, three speed synchromesh type unit with cane type shift. It is attached to the rear face of the flywheel bell housing and is supported on a rubber insulator at the frame centre cross member wich forms the rear engine support. Shift is smooth and positive through a cane type control lever mounted in a shift housing at the top of the assembly. Poppet balls and springs retain the gears in mesh and an interlock prevents shifting into two gears at one time. 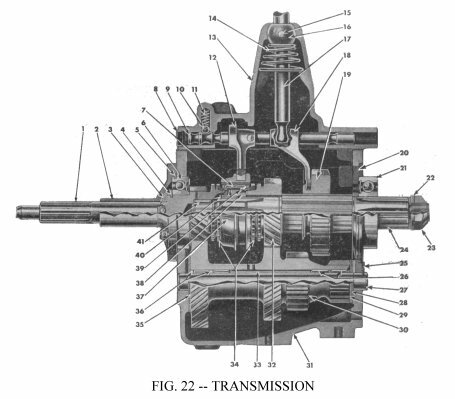 Should any trouble be experienced with the transmission assembly, consult your Willys-Overland Dealer. 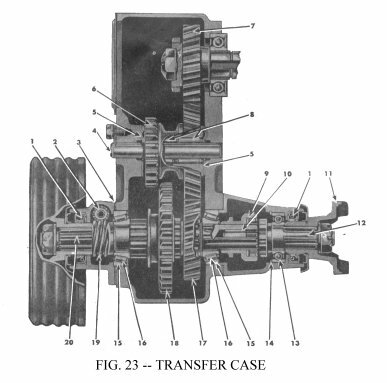 The transfer case Fig. 23 is an auxiliary unit located at the rear of the transmission. It is essentially a two speed transmission, which provides a low and direct gear, also a means of connecting the drive to the front axle. The shifting mechanism is located on the transfer case for engaging and disengaging the drive to the front axle, also for shifting the gears. 10. Output Clutch Shaft Pilot Bushing. On hard surface and level roads, disengage the front axle by placing the transfer case shift lever in the forward position. See Fig. 3 in GETTING STARTED. The right hand lever controls the gear ratio; low and high. The low gear can only be engaged when the left hand lever is in the engaged (rear) position for front drive. Proper position for disengaging axles to use the power take-off with the vehicle standing is shown as “N” in Fig. 3 in GETTING STARTED. Both the transmission and the transfer case are precision built units. No external adjustments are possible and should attention be necessary, it is advisable to consult your Willys-Overland Dealer. IMPORTANT: Check the units at each lubrication to guard against lubricant leakage. For economy the capacity is small – change the lubricant in accordance with instructions in GENERAL LUBRICATION. 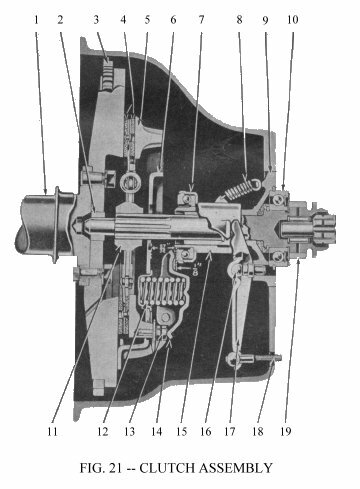 The drive from the transfer case to the front and rear axles is completed through two propeller shafts each equipped with two universal joints. The splined slip joints at the transfer case end of each shaft allows for variations in distance between the transfer case and the axles, due to spring action. Examine both propeller shafts periodically for foreign matter which may become wrapped around them. Check for dents or a bent shaft and make sure that the universal joints attaching bolts are tight at all times. The universal joints have needle type bearings and are so designed that correct assembly is very simple. No hand fitting or special tools are required. 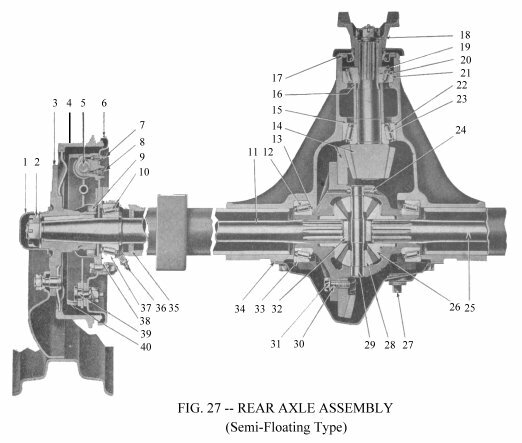 The journal trunnions and needle bearing assemblies are the only parts subject to wear, and when it becomes necessary to replace these parts, the propeller shafts should be removed from the vehicle to facilitate replacement. When reinstalling, note that the slip joints are marked with arrows, Fig. 24, at the spline and the sleeve yoke. Align the arrows so the yokes of the universal joints at the front and rear of each shaft are in the same plane, when assembled, to avoid vibration. The "U" type attaching bolt nuts should be tightened evenly with approximately the same pressure on each nut. The front axle is a live driving unit with hypoid drive gears, Fig. 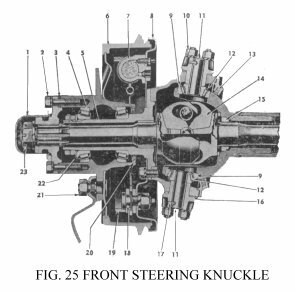 26, and spherical steering knuckles, Fig. 25, containing constant velocity type axle shaft universal joints. 12. Differential Bearing Cone and Rollers. 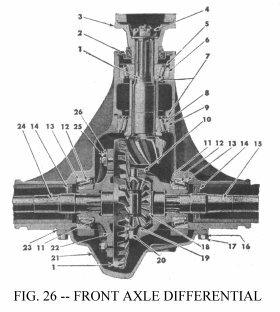 The differential is mounted in a housing similar to that used in the rear axle, except that the drive pinion shaft is toward the rear of the front and to the right of the centre of the axle. This design allows placing the front propeller shaft along the right side of the engine oil pan without reducing the road clearance under the engine. The axle is of the full floating type and the axle shafts can be removed without dismantling the steering knuckles. Once each year have your Willys-Overland Dealer remove the front axle universal joint and shaft assemblies to thoroughly wash out the steering knuckle housings and check the shim adjustment of the universal joints. After checking, the universal joint housings must be refilled with good quality lubricant as specified in the LUBRICATION section. The lubricant is retained in the steering knuckle housings by felt oil seals mounted in twin retainers attached to the inner face of the housings, Fig. 5 in the GETTING STARTED section. These seals also prevent dirt and grit entering the housings. Inspect the seals regularly and replace them promptly if damaged. Keep the spring loaded air vent or breather, mounted in the center housing cover, free of dirt at all times. The rear axle is the semi-floating type, Fig. 27. End float of the axle shafts is adjusted by the shims placed between the brake backing plate and the axle flange. To remove a shaft for reshimming or replacement, first remove the hub cap and bend back the tongues on the shaft lock nut. Use a wheel puller to remove the wheel hub. Remove the bolts holding the brake dust shield, the grease and bearing retainer and the brake assembly. Also remove the shield and retainer. Pull out the shaft, using care not to lose the bearing adjustment shims. Should the end of a broken shaft be inside the axle housing tube, the broken end can usually be removed by making a loop in a piece of wire and working the loop over the end of the shaft using the wire to pull it from the housing. When the shaft is replaced, adjust the bearing with the shims to allow proper end play of the shaft. See “Rear Wheel Bearings” in the SUSPENSION section.